The runners make the Uganda Marathon what it is. The friendships, the community, the fundraising and the determination to finish is why the UGM is truly a Race Like No Other. Here we tell the stories of the runners who took part in 2016 event, as they share their insights and experiences of the week-long adventure. 1. What made you sign up for the Uganda Marathon 2016? P.M – I signed up for the Uganda Marathon 2016 via Deafway (www.deafway.org.uk) because Deafway and UGM offered us an opportunity to fundraise for St Anthony’s School for the deaf [a project based in Uganda] and the opportunity to spend two days with the deaf pupils at the school. S.W – Just like Philippa explained, the opportunity from Deafway who partnered with UGM, to support a deaf school in Uganda. I wanted to go abroad and support the school, as well as run the UGM. 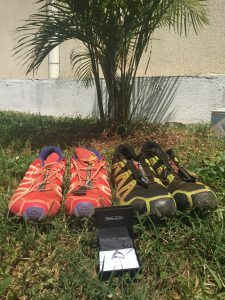 It was my first running experience abroad and a perfect opportunity to kill two birds with one stone. 2. Was it what you expected? P.M – It was beyond what I expected- the camping on top of Masaka, showering outside and many nights relaxing in front of the fire. Also being able to visit the deaf school and meet the pupils who would directly benefit from our fundraising was a bonus. S.W – It was an amazing experience and I really enjoyed the whole trip from start to finish. I went on the safari at the start of the trip and it was out of this world to see so many big animals roaming freely. It also gave us a good feeling of Uganda and what to expect from UGM who were EXCELLENT in their organisation and made us feel very welcome- everyone was great. It was the perfect event for anyone who wants to try out running abroad and to experience different things which they can’t do at home. 3. 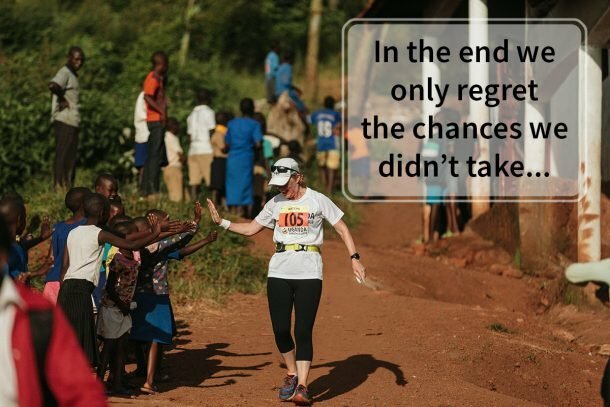 You shared a very special moment on the run; one that has made a lot of people fall in love with your story. Can you please share what happened with us. 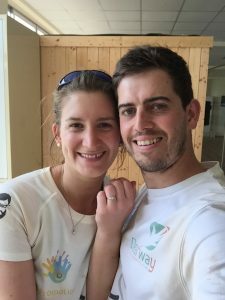 P.M – During the run, I secretly hoped that Steven would propose to me as we had been together for 2 years and he knew my passion for running and travelling. But after a couple of miles that inkling slipped my mind as the orange dust, green bushes and children’s wide smiles took over my mind. It wasn’t until the top of the peak ridge view on the 10th mile that I stopped at a water station for a drink and a quick stretch. Steven was telling me to carry on a little further as there was a lovely viewpoint to stretch, at which point I was in agony after climbing up ‘The Beast’ and ‘the Heartbreak hills’- I never consider how the heck Steven would know that information. Barely after another 100 metres of ‘running’, Steven pulled me over to one side and this is where I saw Sophie’s hand painted sign ‘Philippa, Will you marry me?’. I turned around to find Steven on his knees with a gorgeous ring! In my mind, I was thinking ‘shall I say no’ just to tease him but knew that Dave was filming the whole thing so I went ‘hmmm, yes’! But afterwards, Steven said that I did say ‘no’… We debated over this, our first argument as an engaged couple (! ), so we referred to the video which actually showed that I did say ‘no’ as in ‘no way’ but I didn’t sign that ‘way’. Poor Steven on his knees seeing his other half signing ‘no’ for a split second but luckily I said YES! And guess what, the ring didn’t fit as my fingers swelled up in the heat and the running, but after showering away the sweat and orange dust, the ring did fit! It was surreal to continue our last three miles running to the finishing line and receiving so many congratulating hugs on the way and at the finishing line. S.W – A short and sweet summary of this amazing experience – A PERFECT place to propose to her! I wasn’t nervous or anything like that because she kept dropping hints that she wanted to get married soon! The only near miss experience is that Philippa went to access my running bag for snacks and tried to open the wrong pocket where the ring was safely hidden… I had to stop her and told her that I’ll get it myself because I knew she was fumbling around in the wrong pocket! 4. 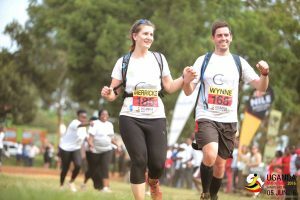 You were running to raise money for Deafway – could you share a little of your story of why you chose this charity and their work in Uganda? 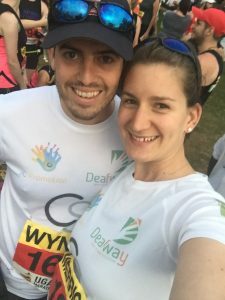 P.M – Deafway, where Steven and I used to work, supported St Anthony’s School for the Deaf since 2010, so we have heard so many amazing stories from the school. The opportunity to run the half marathon in Uganda and meet the deaf pupils who would benefit from our fundraising was too good to miss out on. St Anthony’s School for deaf children in Nkozi, about an hour drive from Masaka, is mainly a boarding school with over 50 pupils. All of the deaf children are taught in Ugandan Sign Language from both deaf and hearing teachers. S.W. – Happy with what Philippa explained about Deafway and the amazing support they provided for Deaf school in Uganda. The children are always happy and enjoyed our visits along with 6 other members of fundraising team [from Deafway]. 5. Could you tell us about the volunteering aspect of the week? P.M and S.W – Every runner both Deaf and hearing had the opportunity to volunteer throughout the week in their chosen projects. For the group of deaf runners, we volunteered at St Anthony’s School for the Deaf. We spent two days in some of the classrooms, sharing our experiences with the deaf children, leading some classroom sessions, and raking and planting vegetables under the scorching sun. We also participated in other projects in Masaka and different inspirational workshops which were accessible for us as Sophie Allen, British Sign Language interpreter, flew out with us. The UGM were brilliant in trying to make sure that we all were included and Sophie had sufficient support in interpreting throughout the week. 6. Could you please sum up UGM for someone who hasn’t yet been? P.M. – The whole week was amazing and we would definitely recommend anyone to go. The experiences you will gain will stay with you forever. It’s definitely ‘a race like no other’ or ‘a week like no other’. S.W. – An amazing and unbelievable experience! Definitely recommended for anyone who wants to run or walk (or crawl) the marathon, with a beautiful setting to take in and with everyone always smiling everywhere. 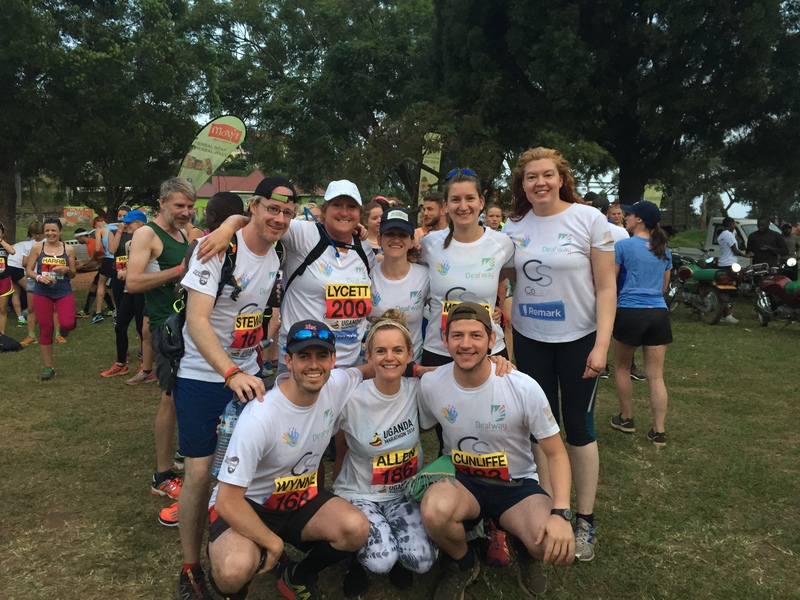 The full team from Deafway on Race Day, with their interpreter Sophie (bottom centre). 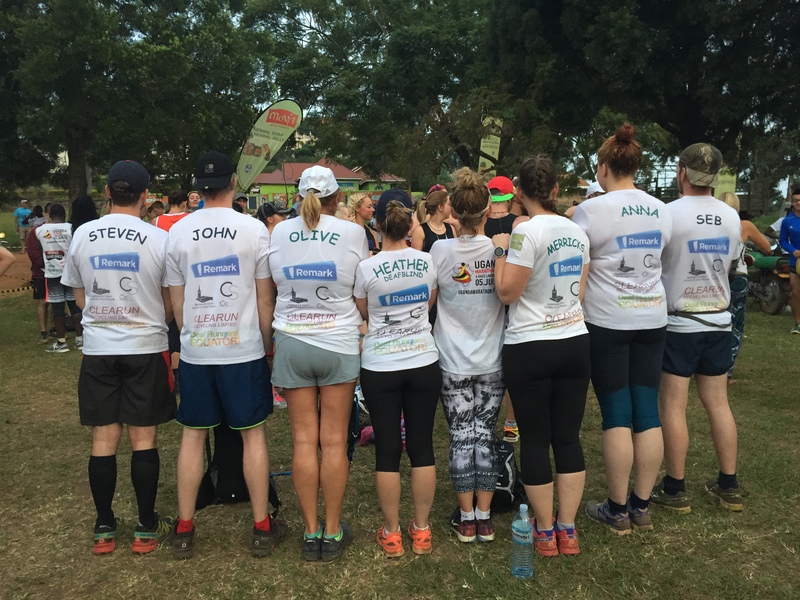 Thank you for joining us in Uganda guys- we loved having you out for the UGM!